It was raining hard in Kelapa Dua in West Java that Tuesday afternoon one year ago, when I entered the gates of the Police Mobile Brigade Command headquarters prison (also known as Mako Brimob). She was waiting for me. We were introduced—“this is Dian Yulia”—then led to a small room with a table and four chairs. She was wearing a niqab, grey gloves and a dark brown gamis (robe), a sombre outfit in stark contrast with the mood: relaxed, calm and cheerful. “I have nausea,” she said lightly in Bahasa Indonesia, holding a bottle of eucalyptus oil. She was two months pregnant. Dian Yulia Novi was meant to be the first female suicide bomber for the Islamic State (ISIS) in Indonesia. She’d planned to detonate a bomb in a pressure cooker at the Indonesian presidential palace, but the scheme was foiled when the police raided her boarding house in Bekasi on the eastern border of Jakarta in December 2016. While the prosecution pushed for a 10-year sentence, the East Jakarta District Court sentenced her to seven-and-a-half years in prison after she confessed. She was the first woman in Indonesia to be convicted for planning such an attack, and ended up in a small room in Mako Brimob with two female police officers assigned to guard her. In May 2018, a year after I met Novi, a riot broke out at Mako Brimob, leading to a 36-hour hostage situation that left five police officers and one inmate dead. According to a police spokesperson, most of the officers had had their throats cut. The riot, as well as bombings in Surabaya that took place within the same week, has been connected to Jamaah Ansharud Daulah, an Indonesian terror group that pledges allegiance to ISIS. Novi was in Mako Brimob with her six-month-old baby daughter during this incident. Media reports say she and her child have now been evacuated to another prison in central Java. Multiple deadly bombings in East Java followed the prison riot. On 13 May, one family of five targeted three churches—while the two teenage sons blew up the Santa Maria Catholic Church in Surabaya, the father drove a bomb-laden car to the Surabaya Centre Pentecostal Church. The mother, accompanied by her 12- and eight-year-old daughters, hit the Diponegoro Indonesian Christian Church. All this occurred within minutes of each other. Later that night, another family died just outside Surabaya when their bomb exploded prematurely. Three children between the ages of 10 and 15 survived. The next day, a third family attacked a police station, also in Surabaya. They’d used two motorcycles—the only survivor from the family was an eight-year-old girl who’d been wedged between her parents at the time. The police have said that the families who attacked the churches and police headquarters had recently returned from Syria (these claims have been disputed by some of their neighbours). While Novi’s plot had been unsuccessful, the attacks carried out by these mothers, bringing their daughters with them, mean that ISIS has officially unleashed the first female suicide bombers in Indonesia. It’s still not clear how ISIS recruits, indoctrinates and convinces women, children and even entire families to become suicide bombers. But my conversation with Novi sheds some light on how a journey of radicalisation unfolds. Novi, an only child, grew up in Bandung, helping her parents with their shop in a traditional market. Like many other Indonesians, she joined a mengaji, a common study group for Indonesian children to learn about the Quran. She would stay home at night; her parents were conservatives and never permitted her to hang out with friends. After graduating from high school, Novi worked in a textile factory, hanging out and shopping with friends in her free time. She later moved to Cirebon, West Java, but decided after several months to leave Indonesia to work as a migrant domestic worker. She moved to Singapore in 2010 at the age of 23, where she worked in the home of a Chinese Christian teacher at a local high school, taking care of three young children; one of thousands of Indonesian women working in Singapore at the time. She was paid USD330 (IDR3 million) every month. She says she wasn’t really happy in her job because it was difficult to get days off—a common complaint among migrant domestic workers in the wealthy city-state. She decided to return home after one-and-a-half years, but took a new job in Taiwan after just a couple of months. She worked for an elderly couple who she called Ama (grandma) and Yeye (grandpa). The work was simple, but tough: Novi was responsible for cleaning the four-storey house in Taichung as well as cooking meals and caring for her 78-year-old employer. The work kept her busy, leaving her with no time to socialise with the sizeable migrant domestic worker community in the city. With few close friends and little opportunity to go out, she tended to stay home and spend her free time on social media platforms. It was during this time—scrolling through Facebook while working overseas—that Dian became aware of people talking about jihad, or holy war. She wasn’t the only one; migrant domestic workers who find themselves isolated in a foreign country might be vulnerable to extremist recruiters or rhetoric online. Between 2015 and 2017, for instance, Singapore repatriated nine allegedly radicalised migrant domestic workers. When approached by New Naratif, Nava Nuriyah, a researcher with the Institute for Policy Analysis and Conflict (IPAC), brings up a domestic migrant worker she’d interviewed in Singapore. The worker had described her life working abroad as an empty vacuous hole; she often watched Korean dramas until she got bored of them. “She began to search for any [Islamic] reading [material] on the Internet. Most of the time Google would bring up Salafi content, and then it will lead the reader to VOA Islam,” Nava says. The Salafi movement is a strictly orthodox, ultra-conservative branch of Sunni Islam, while VOA Islam is a counterfeit version of the US-funded media organisation Voice of America. VOA Islam deliberately publishes fabricated content and disinformation, tricking readers into thinking they are reading the actual VOA website. Nava adds that, aside from Google, Facebook algorithms have also played a significant role in a providing links that connect migrant workers with online terrorist networks. “They want to find ‘a religious friend’ and the [Facebook] algorithm will directly suggest a friend; that’s how these people live in their own bubble,” she says. Sometimes male jihadists also actively seek out targets via Facebook, using “online dating” to woo vulnerable women working as migrant workers and manipulate or “tame” them. Novi started connecting with jihadists on Facebook. “At first, I was curious about these accounts on Facebook posting about jihad. I was ‘stalking’ them. Asking them, ‘What’s the hell is this? Why is this so weird?’” Novi recalled. At that time, she couldn’t understand why people would want to sacrifice their lives and die as martyrs. Tensions between Shia and Sunni sects of the Muslim faith are long-standing and found all across the world. Although they share many fundamental beliefs, there are significant differences in theology, practice and doctrine. While the majority of the world’s Muslims are Sunni, Shia Muslims form the majority in countries like Iran, Bahrain and Lebanon; much of the violence in the Middle East has been attributed to this sectarianism. Novi’s rejection of Shia Muslims fit right in with ISIS ideology. The group, which gained global prominence in 2014, follows a fundamentalist doctrine of Sunni Islam. Novi reached out to a number of individuals posting on Facebook about jihad. One, Fulana binti Fulan, eventually replied to her questions. She convinced Novi that she lived in Syria, and taught her about jihad. Fulana also explained about the different between al-Qaeda and ISIS. “Al-Qaeda, in the past, they followed the Quran and Sunnah (the traditional custom and practice of Islam based on the teachings of the Prophet Muhammad), but lately, the leader seems to use jihad for politics. If they talk about politics, it means they’re no longer fighting in the name of Allah,” Novi said, mentioning the terrorist network’s late leader, Osama bin Laden. She also cited Jabhat al-Nusra, a jihadist organisation fighting against the Syrian government with the intention of establishing an Islamic state; following ISIS’ scorn for both al-Qaeda and al-Nusra, she accused them of “joining” the United States of America and referred to them as “minions”. “Jihad is about fighting to uphold the religion of Allah without any other intentions, including for one’s own business or one’s group’s interest,” Novi explained. Novi also took issue with Pancasila, the five principles that underpin the philosophy of the Indonesian state. She referred to Pancasila as a case of shirk, or the practice of polytheism or idolatry. “Why do have we to adhere to Pancasila and not Islam?” she demanded, arguing that following Pancasila was indication of a lack of trust in the Quran’s law. She didn’t understand why Indonesia, as the largest Muslim community in the world, did not adhere to Islam and the Quran as their basic principles. It’s a view also held by the hardline Islamist group Hizbut Tahrir Indonesia (HTI), disbanded by the Jokowi administration for conducting activities that contradicted Pancasila and the principle of a unitary Indonesian state—a move that attracted the ire of more strident voices online, such as the Muslim Cyber Army. Robertus Robert, a Pancasila expert from Universitas Negeri Jakarta said that the Pancasila had actually once been closer to Islamist desires: at one point in its drafting in 1945, the first principle was phrased as “Ketuhanan dengan kewajiban menjalankan syariah Islam bagi pemeluk-pemeluknya (Belief in Almighty God with the obligation for its Muslim adherents to follow Islamic law)”. It was included in the Jakarta Charter by the Muslim faction in the Investigating Committee for Preparatory Work for Independence (BPUPKI). The first principle was then revised to “Ketuhanan yang Maha Esa (Belief in One God)” after Indonesia’s prominent leaders from different backgrounds—both Islamic and secular nationalists—agreed to compromise. Apart from her scorn for the Pancasila, Novi laid out other beliefs picked up from ISIS: a Muslim, she said, is not a true adherent of Islam if they follow a political leader such as a president. In ISIS’ eyes, a leader is someone who rules under the administration of the Islamic State. Individuals who idolise an ulema (a body of Muslim scholars with knowledge of sacred Islamic law and theology) seen as using the teachings of the Quran for their own business or political interests are also rejected by ISIS, Novi said. For example, she saw both the Indonesian Ulema Council, the country’s top Muslim clerical body, and the Islamic Defenders Front, a far-right Sunni Islamist organisation, as political organisations that compromised far too much with Jokowi’s administration. She angrily insisted that they were unworthy of respect. For Novi, her country, although majority Muslim, was a long way away from the true Islamic nation she felt it should be. Novi had believed that she was fulfilling all the duties of a good Muslim: praying five times a day, fasting during Ramadan and reading the Quran. But after learning about jihad online, she decided that she wanted to go much further: she wanted to join the holy war. It’s a question for which Novi does not seem to have a very clear answer. She told New Naratif that she had simply wanted to do something meaningful, at least once in her life. For a year before her arrest, Novi learned about syariah Islam from Fulana over Facebook and applied it as much as possible in her everyday life; she said it strengthened her intention to participate in jihad. She told another ISIS follower, Ummi Abza, about her plan. At that point, Abza was only a Facebook friend; she had never met this person before. Novi then met Abza once and was introduced to Nur Solihin, who in turn had been recruited by Bahrun Naim, the most infamous Indonesian fighting with ISIS in Syria and Jamaah Ansharud Daulah’s chief provocateur. Novi, who wanted to get married before being martyred, wed Solihin in Malang, East Java, without her parents’ knowledge. They had never met in person or even swapped photographs before marrying; Solihin was also already married with three children. Both her new husband and Bahrun told her that she had to target the Indonesian president, Joko “Jokowi” Widodo. They said that he was an infidel, just like the President of the United States, Donald Trump. They pointed at Trump’s executive order which blocked citizens of seven Muslim-majority countries from entering the United States for 90 days—highly criticised as a “Muslim ban”—as proof that the United States was anti-Islam. “There will be a war between Muslims and America (USA),” Novi declared. Over the past two years, there has been a perceived rise in the participation of women in ISIS in Indonesia. For the first time in Indonesia’s history of counter-terrorism work, in December 2016 the police arrested three women involved in planned bombings: Novi, Arida Putri Maharani and Tutin Sugiarti. 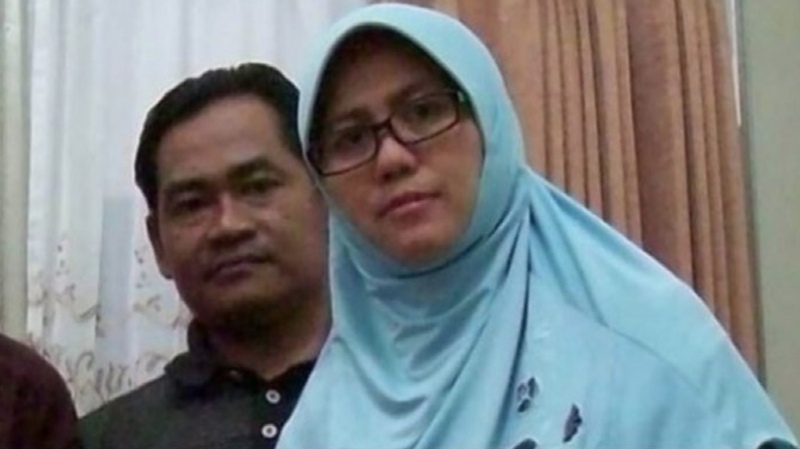 This month, Puji Kuswati, who attacked the church in Surabaya with her daughters, and Puspita Sari, who died with her family when the bomb they were making went off prematurely in a flat in Sidoarjo, died as the first female ISIS militants in Indonesia. “Yes, there is a difference between men and women in Islam. For example, in jihad, it is not mandatory for women [to participate]. But for now, jihad is fardhu ain (mandatory for all Muslims), like praying,” Novi said. ISIS’ view, as she understood it, was that every Muslim had to join the war. According to Novi, Indonesia’s female brigade was inspired by the al-Khansaa Brigade, an all-female ISIS police brigade that keeps other women in line with the group’s ideas of Islamic practice. When Raqqa was still an ISIS stronghold, the al-Khansaa Brigade were, essentially, the morality police, ensuring that women were fully covered in public and accompanied by male chaperones. “It’s not a so-called emancipation of the female jihadist,” Novi said. Although the women of the al-Khansaa Brigade were trained, armed and reportedly paid, their operations were still about keeping women subservient to men. The same applied to the Indonesian brigade Novi joined; no matter how fervent the women’s belief, the men were still the leaders. Nur Solihin, who has also been arrested and jailed, led her operation. “In jihad, if it’s needed then women can join,” she explained. “But as long as the man can do the jihad, we’ll prioritise them to do that.” Despite the belief that participating in jihad is the duty of every Muslim, ISIS still emphasises the involvement of men over that of women. We spoke for two hours before she asked me to leave; it was time for her to pray. I left feeling twitchy and restless. Indonesia has the largest Muslim population of any country in the world, and, while on the fringes, ISIS wields some influence here. I still couldn’t quite comprehend why she had been so committed to kill and die for ISIS, and many questions remained: how many members are there in ISIS’ female brigade? How many children will be sacrificed in the name of an Islamic State? The recent bombings have been unprecedented in that they’ve been family efforts. Little is known about how family networks figure into the ISIS presence in Indonesia, although some efforts, like deradicalisation schools, are trying to address generational terrorism. As terror attacks occur in Indonesia during this Ramadan season, the fear is that there might be many more like Novi out there. Febriana Firdaus is an independent investigative journalist based in Jakarta, Indonesia. She has reported on politics, corruption, human and LGBT rights, the 1965 purge, Papua, and ISIS. She is an editor of Ingat65, an online project for young people’s perspectives on the legacy of Indonesia’s 1965–66 massacres, and manages the Voice of Papua newsletter. She has previously worked at Tempo and Rappler. Her freelance work has appeared in TIME, BBC Indonesia, Jakarta Post, VICE Indonesia, etc. In 2017, she received the Indonesian Oktovianus Pogau Journalism Award in Courage for her fearless reporting on human rights, including on LGBT issues.